Good afternoon dolls! Today I wanted to write about a trend that I am SO excited is HUGE this fall/winter: POLKA DOTS! Of all patterns, this is my absolute favorite because it is so fun but at the same time very classy. While I would normally just wear just one polka dotted piece, the coordinating colors of this navy blazer & black skirt look GREAT together. Also the polka dot hose are AMAZING...would be a great way to add polka dots to your outfit! 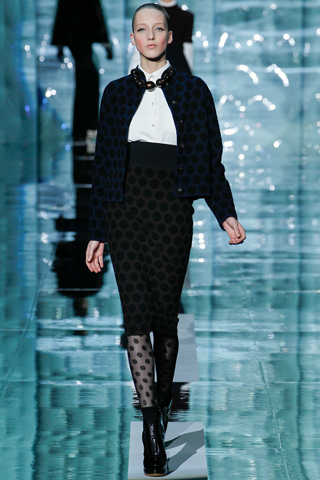 Also love this look from Marc Jacobs. Color-blocking was big this summer but is also carrying into the fall, and I like the look of the maroon and blue dress. I love that this look combines another huge trend with polka dots: LACE! It doesn't get more feminine than polka dots & lace. This is a look with high drama! I've always loved red with b&w polka dots (and not to mention the matching red lipstick!). This is the perfect example of the right way to mix prints. The polka dotted jacket looks FANTASTIC with this printed skirt because they are in the same color family, and also the solid black blouse breaks up the patterns. I want this outfit (esp with those fab shades!)!! Sigh...I am OBSESSED with this outfit! 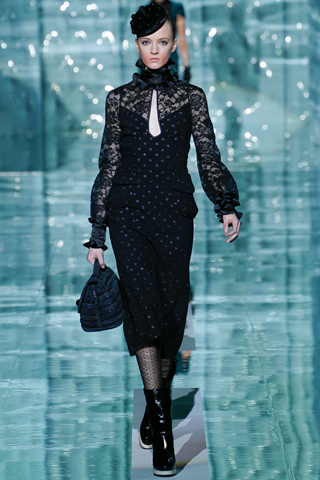 I love how the sheer sleeves subtly add a touch of polka dots. So lady-like! Sheer polka dot blouses were big on the Stella McCartney runway! Love the combination of the different sized polka dots on the blouse and skirt. The sheer polka dot sleeve & cut-out adds some fun to a LBD! As you can see, polka dot dresses & skirts are HUGE! However you can incorporate the runway into your every day look by wearing polka dotted blouses, shoes, purses and even tights. Polka dotted ANYTHING is the way to go this fall/winter!!! Forever 21 is a GREAT place to look right now for polka dot items and their prices are very reasonable. Just compare this J. Crew blouse with one I bought at F21. The following J.Crew blouse costs $88.00 (online here: J. Crew Polka Dot Blouse). I know I’m going to wear this shirt with SO many things…tucked into skirts, belted with black skinny jeans and heels/boots, under a blazer or sweater, or even belted over a dress. I couldn't find this shirt online but I literally bought it last weekend so you should check your local F21! Such a steal! Are you planning on wearing polka dots this fall/winter season?! I would love to hear what you think about this trend; leave me a comment below & let me know!!! Also don't forget to follow my blog! Thank you very much for reading! Have a very stylish day!! !